Let everyone know your amazing news by sending out these Save The Dates! This elegant and classic save the date is simple, yet effective and completely on trend with it’s blush colour. For an extra special touch gold (or even rose gold!) foiling can be added to the print for an extra cost. Printed on 350gsm card, A6 in size (105mm x 148mm) and comes with a C6 white envelope. Envelope liners can be added for an extra cost. If you would like a different colour then please contact me for more details and I will be happy to discuss your requirements further. 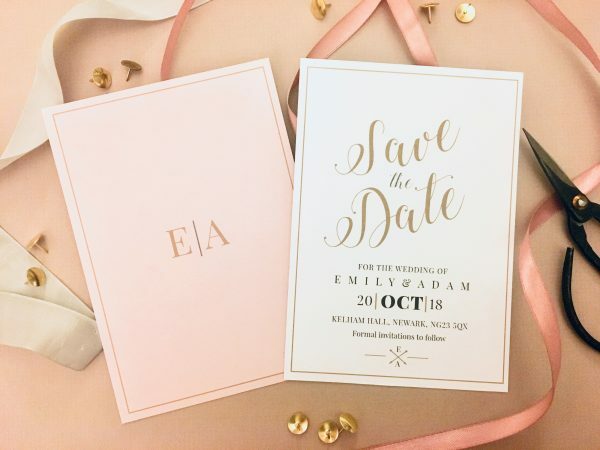 The design will be personalised with your wedding details; just add the quantity you require to your cart. I will then be in touch to send you a simple online form to complete, then I will work my magic to create your beautiful design! Please ensure all details entered on the form are correct before submitting, I will then create a proof to send to you for checking. You will have 2 rounds of amends before sending to print. Please note – Hatton&Co cannot be held responsible for misspelling or incorrect information. Please ensure that you provide the correct details and spell check your proofs before sending to print.